Caring for carnivorous plants is a little bit different from caring for a fern or a potted rose. This is because in order for the plant to live it needs to feel like it is still in its natural habitat. You cannot use regular potting soil when planting or repotting carnivorous plants or you will kill them. You need to use a mixture of clean sand (the kind for swimming pool filters works great), sphagnum peat moss, perlite, and ling fiber sphagnum moss. You cannot use any fertilizers in your mixture and be sure that there are no fertilizer additives in the components of your mixture when you buy them. This mixture works best because it is low in nitrogen and other nutrients that are found in regular potting soil, and because they retain water better. 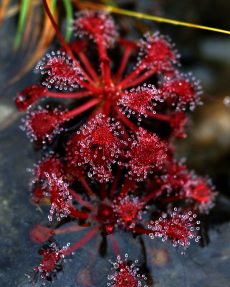 You should keep your carnivorous plants well watered, but be very careful not to over-water them. Make sure that your pot is well drained. It is best to keep a plate under the drained pot and keep about a half an inch to an inch of water in the plate so that the plant can soak up the water when it is needed. The water you use cannot be tap water. Tap water is full of chemicals that will kill a carnivorous plant with time. Distilled water or captured rain water works very well for carnivorous plants. You can get some of the chemicals out of tap water, like the chlorine that harms carnivorous plants, by setting it out in the sun for about a week before using it, but the rain water or distilled water are still the best. The pots you plant your carnivorous plants in should be glazed or plastic pots. Don't use clay pots because they will eventually release chemicals and salt into the soil mixture that your plants won't like. In the wild, carnivorous plants are perfectly capable of catching their own food. Since your carnivorous plant lives indoors and doesn't have access to its usual food source, insects, then you will need to provide the food for them. 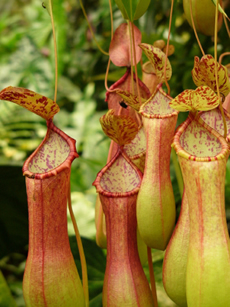 Carnivorous plants only get a portion of their nutrients from insects and other invertebrates so you only need to feed your indoor carnivorous plant one or two small insects each week, or even every two weeks. Using these simple care instructions to take care of your carnivorous plants will surely keep them alive and well for a much longer time, years perhaps, than if you treat them like any other house plant.